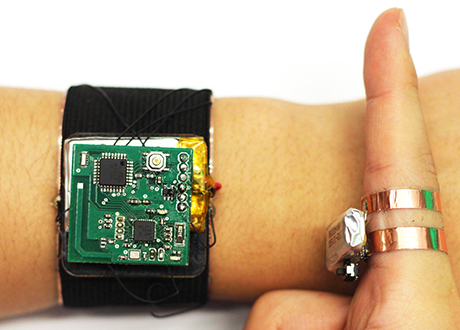 SkinTrack is a wearable system that enables continuous touch tracking on the skin. It consists of a ring, which emits a continuous high frequency AC signal, and a sensing wristband with multiple electrodes. 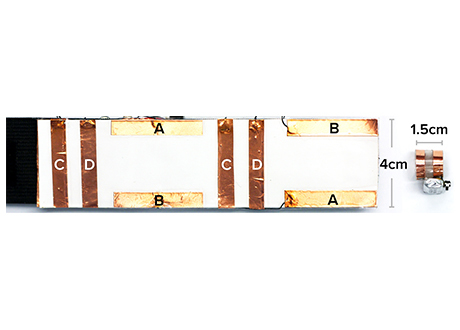 Due to the phase delay inherent in a high-frequency AC signal propagating through the body, a phase difference can be observed between pairs of electrodes. SkinTrack measures these phase differences to compute a 2D finger touch coordinate. Our approach can segment touch events at 99% accuracy, and resolve the 2D location of touches with a mean error of 7.6mm. 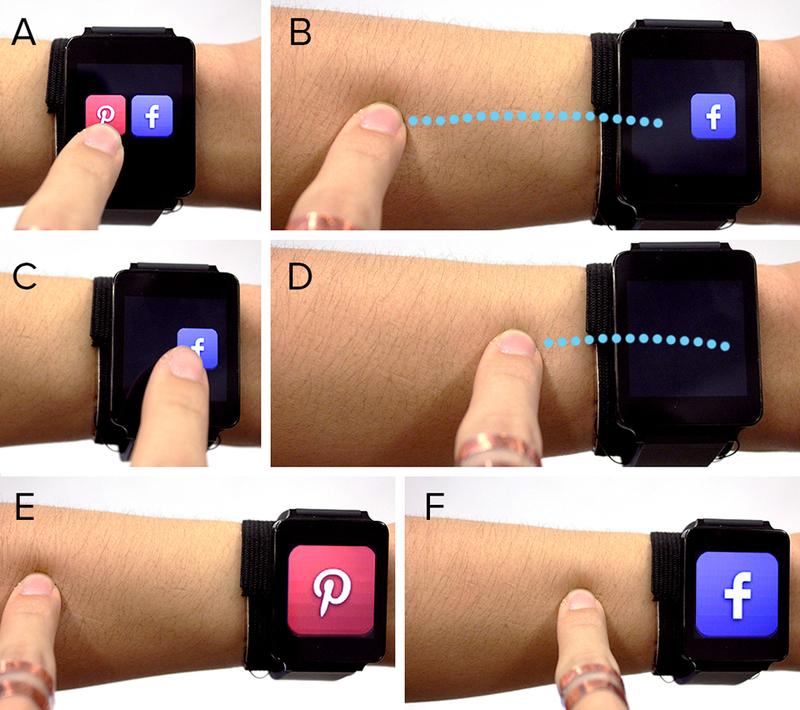 As our approach is compact, non-invasive, low-cost and lowpowered, we envision the technology being integrated into future smartwatches, supporting rich touch interactions beyond the confines of the small touchscreen. Zhang, Y., Zhou, J., Laput, G. and Harrison, C. 2016. 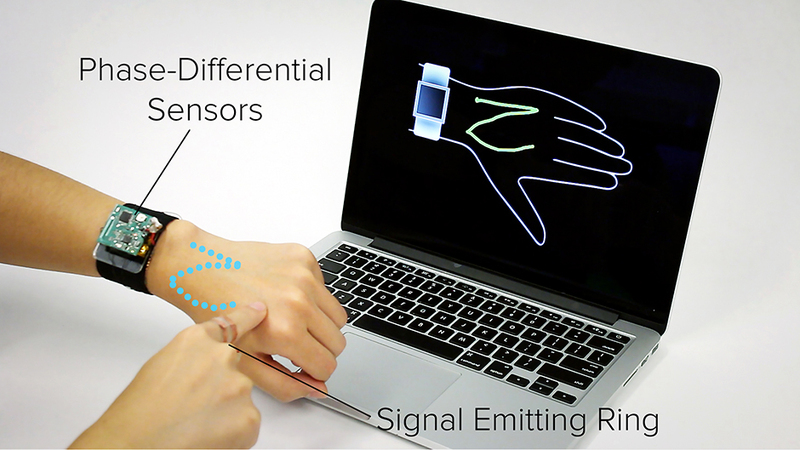 SkinTrack: Using the Body as an Electrical Waveguide for Continuous Finger Tracking on the Skin. In Proceedings of the 34th Annual ACM Conference on Human Factors in Computing Systems (San Jose, California, May 7 - 13, 2016). CHI '16. ACM, San Jose, CA.